Prime, Highlight and Hydrate with this first ever tri-phase liquid highlighting oil! Skin is kissed with an intoxicating, multidimensional highlighting effect. Silky smooth, lightweight, moisturizing, and long-lasting. Unique, elastomer powder with soft-focus properties soften skin. Squalane Oil derived from sugarcane helps to nourish skin. 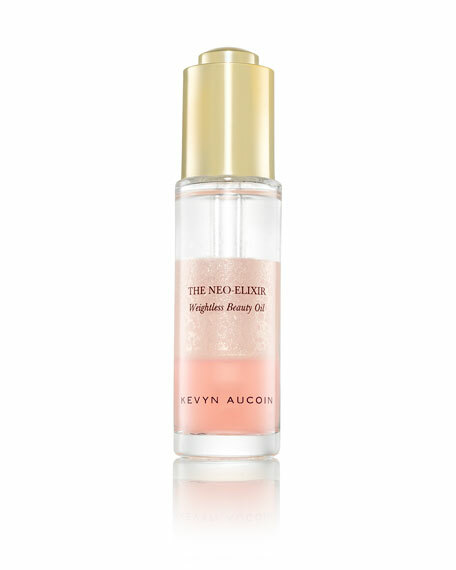 Blends perfectly with The Celestial Skin Liquid Lighting and The Sensual Skin Enhancer for a dewy finish. PRO TIP: Add a drop of oil to any foundation to create a dewy finish. Take a drop of oil and tap the oil on cheekbones to create a "glossy" editorial finish. For in-store inquiries, use sku #2484801.